One of the positive facts you can find when you break one of your bones is that it gives you plenty of time to build some new LEGO models ! 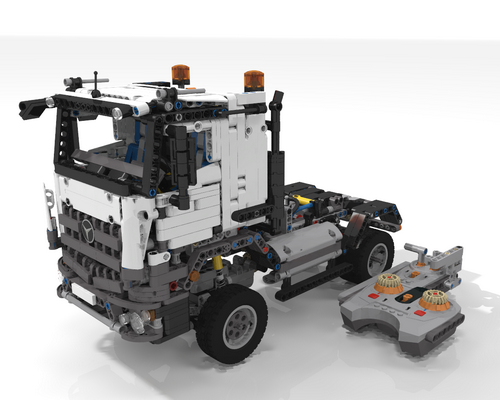 Last year, LEGO released the 42043 set, the Mercedes-Benz Arocs 3245. It quickly became the flag ship of the brand, the one everybody was waiting for. In my very humble opinion, that set is totally overrated. Of course it’s well designed, has a nice look and it was, at the release date, the biggest lego technic set ever produced, but the pneumatic functions of the crane were totally unefficient, making the set almost valueless speaking of playability. The B Model of the set is a smaller version of the Arocs, the 1845 (an Actros ? ), it’s composed of a truck and its trailer. Overall, the B model is for me much better, the look remains excellent but the addition of the trailer makes it much better to play with. All the pneumatic stuff was moved to the trailer and used to build a smaller crane, more efficient than the one from the A model. All considered, that B model is a much better build, more fun, integrating almost all the functionnalities of the A model, just better developped and organized. It’s after watching some Youtube videos than I realized that the B model has such a great mocing potential. 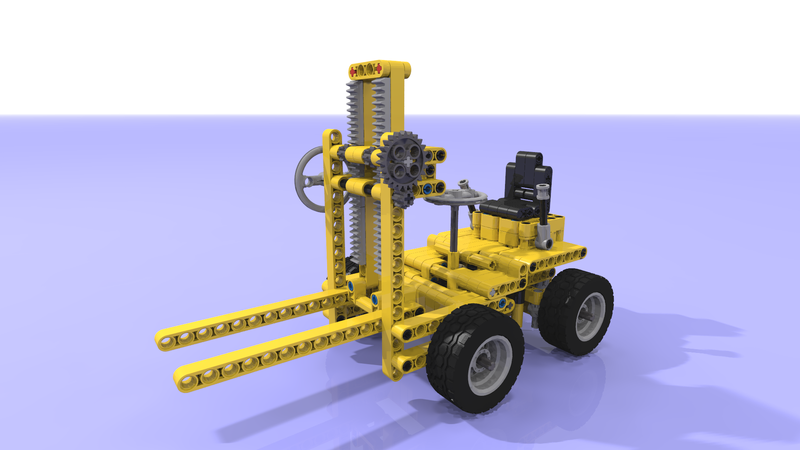 The one realized by PPUNG DADDY (From Korea), a full remote controlled version of the truck, inspired me and made me decide to build an advanced version of the 1845, including more functions. 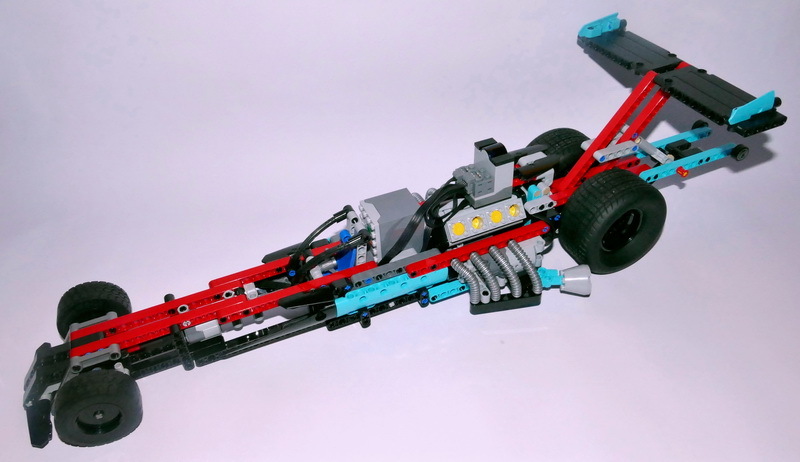 Driving (rear axle, doubled wheels) : What’s the goal ? It’s a truck whose aim is to move trailers. Does it have to move fast ? Clearly not, or manoeuvres will be extremely complicated, especially when moving backward with a trailer attached. So, I decided to use a simple L motor and to hide it the better I could. I removed the fake motor and placed the L motor at its place, this left me enough space for gearing down and deliver enough torque to the rear axle at a reasonnably speed. The biggest interest of this solution is that the power function motor is totally hidden under the cabin which greatly help to preserve the overall design. Front lights : The hardest challenge of that improvement was to hide the light emitted by the power function lights on the sides of the truck and on the front part of the front wheels. I decided not to transform the 1845 into a nightclub and to limit myself to the 2 biggest lights of the truck, situated on each sides of the front bumper. Infra red receivers : 3 motors and one light kit makes 4, so I had to place 2 IR Receivers, and if possible, not far of the battery (that did not moved). Lots of trucks have a radiator for the climatisation behind the cabin, I’ve built one to hide my 2 receivers, It’s not to much ugly and the receivers are well hidden. Small counterpart, you have to be behind the truck to drive it. Pneumatic pump : Placed just behind the cab, it’s not very discreet, but people usually enjoy watching that kind of mechanism when it is in action (I try to justify my choice !). The motor for the pump is located under the cab too, totally invisible. Air tank : The use of an air tank really improves the use of the pneumatic functions and makes it more realistic. You don’t have to make the pump work when you want to move the cab or open the 5th wheel and this is really a plus. It replaces the spare wheel on the side of the truck (note : I made 2 PDF instructions files, one with the air tank, and another one without, that part is rare). I’m quite satisfied of that moc. It asked me lots of reworking time (30+ hours), I had to make several technical choices and find how to add functions without denaturing the original model. Please note that you’ll need almost 100 additional parts to build the truck, none of them are rare (except the air tank). Making the instructions and the computer images took me around 20 hours. I got lots of questions about the softwares I used so I’ll soon make a post about that.